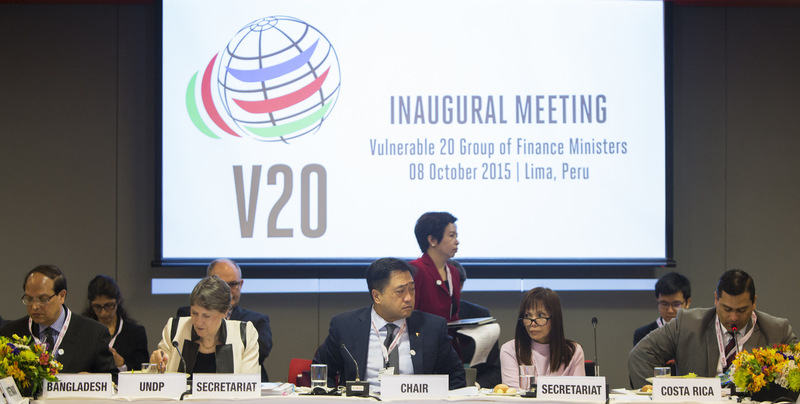 We, the Finance Ministers of the Vulnerable Twenty (V20) Group, in our inaugural meeting this 8th day of October 2015 in Lima, Peru, chaired by the Philippines’ Finance Secretary, Cesar Purisima, hereby set forth our common and collective challenges, aspirations, and proposed actions in this Communiqué. As called for by the Climate Vulnerable Forum (CVF) in its 2013-15 Costa Rica Action Plan, we agreed to form the V20 and discussed the role, objectives and activities of the group moving forward, and agreed to the creation of this new mechanism as a platform for leaders and countries highly vulnerable to climate change around the globe to highlight shared interests and contribute substantively to discussions on finance and other means of implementation, particularly to foster a significant increase in investment in climate resiliency and low emissions development. On this day, we established the V20 to serve as a new high-level mechanism for dialogue and action to concentrate attention on economic and financial responses to climate change through the dedicated cooperative efforts of economies systemically vulnerable to this global phenomenon. We believe urgent and ambitious global climate action is now a fundamental human right. Everyone, especially those living in the most vulnerable areas of the planet, has a right to breathe clean air, to drink clean water, and to live in prosperity on a secure and sustainable planet. Ineffective action on climate change deprives us of such rights. Climate change is the defining challenge of our time. Overcoming it is a matter of survival for people on all continents and vulnerable communities everywhere. Standing on those frontiers most fragile to decades of inadequately checked human-induced climate change, we call out with a plea for humanity to unite. Together, we fight for a new hope. Representing a significant number of nations most vulnerable to climate change, we are low-and middle-income, least developed, arid, isthmus, landlocked, mountainous, and small island-developing countries from Africa, Asia, the Caribbean, Latin America, and the Pacific. Home to close to 700 million people–or approximately one in ten alive today–our twenty nations are hugely diverse in ecology, biodiversity, culture, geography, language, population and territorial extent. We are united in our shared vulnerability and exposure to a changing climate. Likewise, we share the commonality of an equally marginal contribution to warming–at less than 2% of current greenhouse gas emissions–and means to directly address the monumental challenges of global climate change, recalling that nearly half our people live in extreme forms of poverty, which the international community has pledged to eliminate by 2030 with the global Sustainable Development Goals. the threat of increasingly devastating and more frequent disasters, such as storms, flooding and drought. We note the progress already made by V20 countries in promoting and undertaking climate action that serves as a foundation for future V20 work but draw attention to significant human, technological, institutional, risk-based and other special constraints facing vulnerable developing countries. In this critical year, the minimum deliverable for the UN Climate Change Conference at Paris (UNFCCCCOP21) is an agreement entirely consistent with the non-negotiable survival of our kind. Given this and the extent to which climate change has set back the lives of our people, denied human rights, and devastated our homes and entire nations, we recognize climate action as a foremost humanitarian priority for the international community. To concretize our own support for this international priority, we, the V20, commit to act collectively and decisively to promote the mobilization of public and private climate finance from wide ranging sources, including international, regional and domestic mobilization; share and exchange best practices on economic and financial aspects of climate action; develop and implement new, improved and innovative approaches; and engage in advocacy and other joint actions. In a major first step, we agree to study the creation of a sovereignV20 Climate Risk Pooling Mechanism to distribute economic and financial risks, to improve recovery after climate-induced extreme weather events and disasters, and to enhance security of jobs, livelihoods, businesses and investors. This trans-regional public-private mechanism modeled on similar pre-existing regional facilities, featuring index-based risk transferal and other innovative insurance tools, would specifically address acute and chronic hydro-meteorological hazards, as affected by climate change. It would also improve spatial and temporal risk distribution resulting in highly accessible, dependable and cost-efficient insurance while incentivizing, through risk-determined pricing, upscaled adaptation measures. We support innovative revenue generating fiscal and financial measures to finance climate action. A possible example is financial transaction tax and how the same can generate additional resources sourced from capital markets, while serving as a stabilizing financial measure. We also call for improved access to international climate change finance from all sources – public or private – towards adaptation and mitigation action. This can be done through streamlining processes, with special considerations to the capacities and realities of vulnerable developing countries, and supporting institutional readiness and administrative capabilities to access available climate finance. We will strive to develop or improve financial accounting models and methodologies and cost-benefit analysis to enhance accounting of climate change costs and effects and improve valuation of climate risks and co-benefits of climate action, among others. This will build on public and private sector initiatives on environment and natural resource accounting and valuation. We agree on the annexed V20 Action Plan focused on attaining a significant increase in climate investment in our countries through the voluntary country-owned, country-driven, and country-led design and application of financial innovations, in collaboration with our country partners, international financial institutions, and development banks while leveraging finance in all its forms, expertise, and technology from international resources. In pursuit of our vision of the world economy as a driving force for a resolution to the climate crisis, we plan to act as one to help lead the world towards a climate resilient future by inspiring strengthened efforts by all. We acknowledge that expanding our inherently limited contributions could nevertheless help to lessen the gap between life and death, prosperity and suffering, existence and annihilation: Every action will count just as every life does. We look for a new international partnership with development partners, business and public-private arrangements to support the realization of V20 ambitions. We invite international financial institutions, international development actors and other relevant international institutions, including the WBG, the IMF, regional development banks, the UN Secretariat, UNDP and others to work collaboratively in delivering enhanced capacity and other assistance, including capacity building and technical assistance, to facilitate the efforts of V20 members as we work to achieve these objectives and initiatives here outlined. We strongly welcome the increased climate focus and momentum for action by international financial institutions, bilateral and multilateral institutions, international organizations, the G7 and G20, and business, civil society and faith groups, among others. This includes the G20 commitment to phasing out inefficient fossil fuel subsidies and the launch of the Green Climate Fund. We expect the realization of internationally recognized commitments on climate change finance, in particular the US$100 billion per year from 2020 joint mobilization target of developed countries to support developing countries in responding to climate change in the context of meaningful mitigation actions and transparency on implementation. We urge a rapid acceleration of progress towards an equal [50:50] balance of resources for adaptation compared with mitigation [by 2020 at the latest]. In light of the scale of the challenges faced and the manifest inadequacy of current efforts to tackle climate change, we also seek further contributions in finance, capacity building, technology transfer and development, and fair share emission reductions, aimed at delivering climate justice for all humankind including robust climate security for those vulnerable groups so heavily exposed both now and tomorrow, especially our women and children, the poor and future generations. We have established an assigned V20 Working Group to define milestones and commence implementation of our Action Plan ahead of COP21 in Paris based on national circumstances. In guiding the Working Group’s efforts, we recognize the primacy and urgency of building climate resilient countries and the importance of safeguarding workplace health and productivity in light of increasingly adverse thermal conditions brought about by climate change. We will operate on a voluntary basis in cooperation and in partnership, as well as in recognition of common but differentiated responsibilities and of limits on our achievements in the absence of international support. We will promote learning, coordination and complementarities of efforts. We will meet biannually in the margins of the WBG/IMF Spring and Annual meetings and will monitor follow-up.